As a student, Sina Leilua (Tainui) did her first practicum placement at Botany Downs Secondary College. Now she teaches science and biology there full-time. 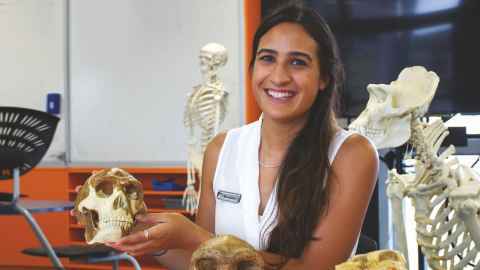 “I am teaching science and biology at Botany Downs Secondary College this year, which was the school I was at for my first practicum. “Going on practicum was the highlight of this programme for me as in the end I felt I was confident enough to teach in my own classroom. “I went on practicum at two schools that were very different from each other, which allowed me to adapt my teaching style and prepared me for anything that came my way. “It also helped me to decide what type of school I wanted to teach in and reassured me that I was on the right path to a career that I would love. “I enjoyed the assignments that were set for my science and biology courses. For example, for one assignment we had to create our own website. Sina was a recipient of a TeachNZ Kupe Scholarship for Māori and Pasifika High Achievers.